april*-8gb.img.xz Ready-made image file, write straight to a 8GB (or larger) Flash-stick or SD-card. Burn to a CD/DVD, also used for "frugal" installation. This is the Quirky Installer, with a nice GUI. 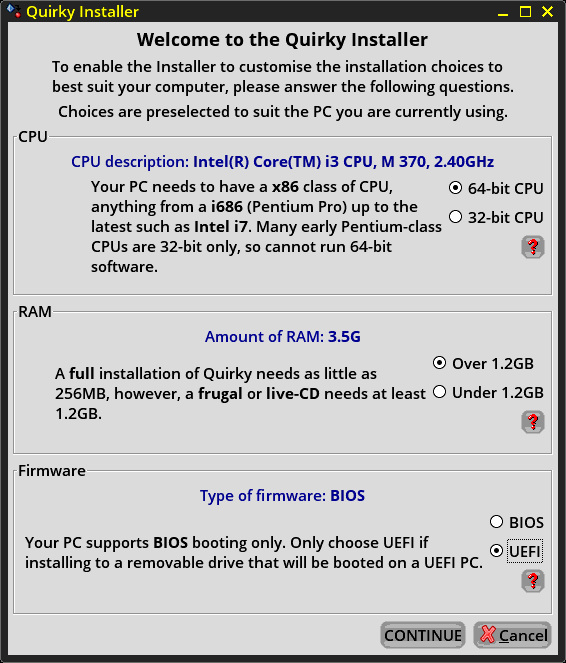 The Quirky Installer, introduced below, will offer to download the appropriate file, however you can also do so manually, as the Installer only downloads from ibiblio.org which is slow. There are some faster mirrors that you can download from. But, you can manually download 'april*.usfs.xz' if you wish. There is a ready-to-go image for a 8GB USB-stick, that is not handled (yet) by the Quirky Installer, named 'april*-8gb.img.xz'. If you have a 8GB (or greater) stick available, that is a simple alternative way to install and evaluate Quirky. This is also an option if you are running Windows or OSX. Warning: Unlike Puppy Linux, the Quirky live-CD boots into and runs entirely in RAM. For those who know something about the architecture of Puppy, Quirky does not support SFS files, nor support a "save file". So, one restriction is that at least 2GB of RAM is required. The live-CD does have some uses. It can be a means of booting and evaluating Quirky. It can also be a means of running the Quirky Installer as described above, so you can then do a proper install. Another use for the live-CD is that it does have a "save" icon on the desktop, for remastering the CD, that is, creating another live-CD (or DVD). The point of doing that, is it would be configured for your video, network, etc. The remastered CD can be used to bootup without touching the hard drive, surf the web, then shutdown without having left any "footprint". The live-CD also has an "install" icon on the desktop that will do a frugal installation to hard drive -- "frugal" is a term familiar to Puppy Linux users. This frugal installation has the same limitations as running from a live-CD. It also runs in RAM, and sessions are not automatically saved -- it does have a "save" icon on the desktop, and can do a save, to save settings, in the same manner as for the live-CD -- however, there is no "save file"! Emphasizing again, the live-CD and frugal installation of Quirky has limitations and is only intended for evaluation, and perhaps to install Quirky properly. Though, it should be noted that some people actually want those limitations -- for example, although the live-CD is slow to boot and needs lots of RAM and has extremely limited save capability, it does not even look at the hard drive, and once booted is very fast. Another important point: live-CD requires that Legacy Boot be enabled in UEFI-Setup. Though, it is on my TODO list to make the live-CD UEFI compatible.